June. Peak activity time in British gardens, both for working (especially if you use bedding plants and half-hardies) and for visiting. So of course off we go on holiday. 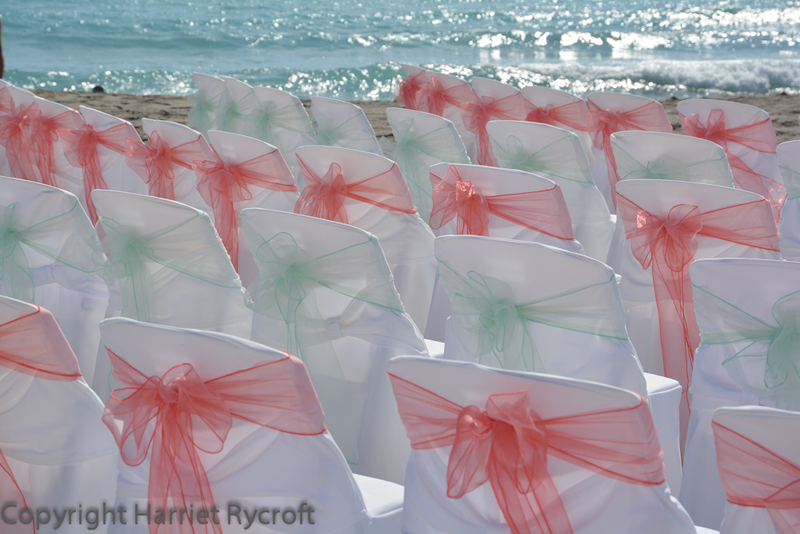 It wan’t just a whim, we did have the excuse of a family wedding to go to – and it was a family wedding on a BEACH, definitely not to be missed. 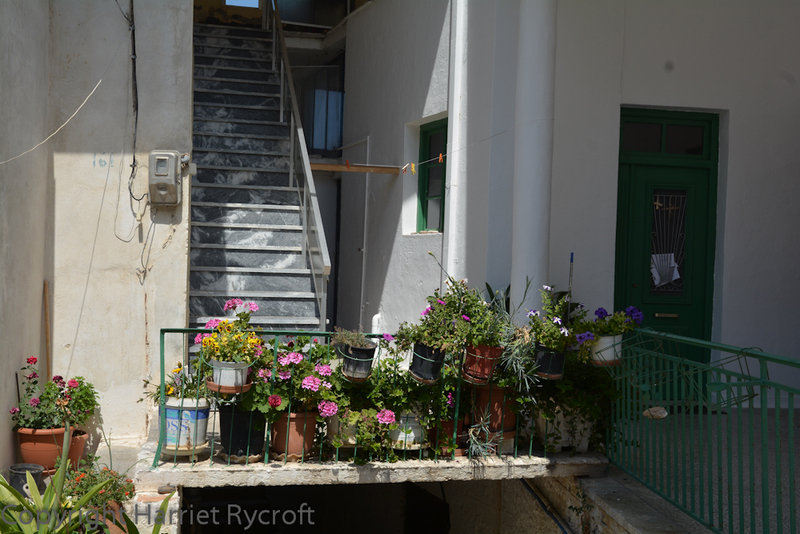 We blithely left our 19 year old son in charge of my 250-odd pots and hundreds of young plants and flew to Crete. The first day was Culture Day. 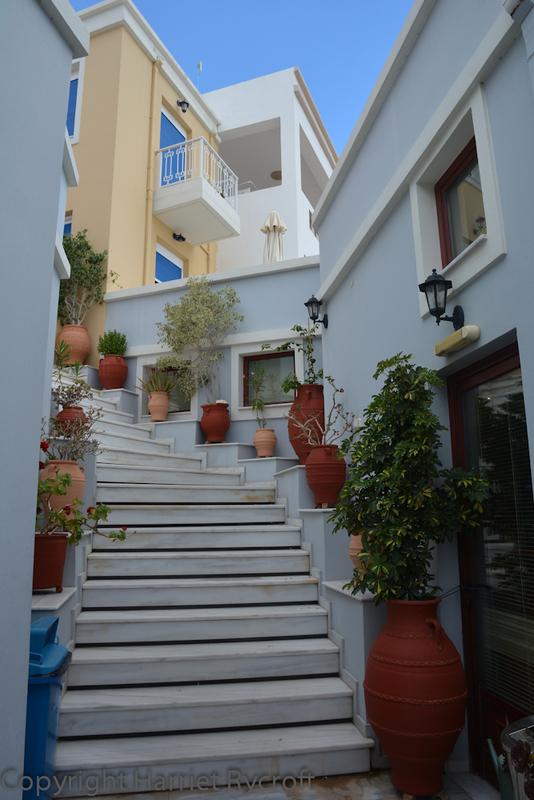 The Heraklion Archaeological Museum has recently been refurbished and is magnificent. 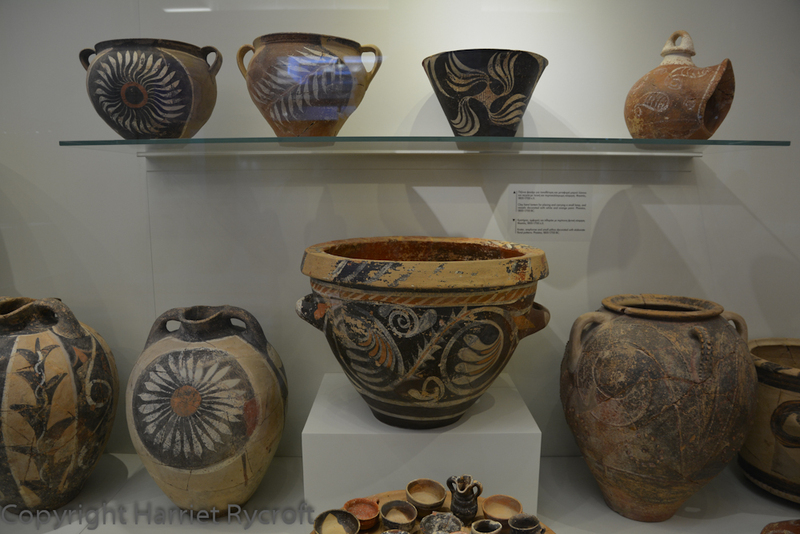 I normally find museums exhausting – something about the low-lighting and lack of oxygen, I think – but this one is easy to circulate around, has clear interpretation but not too much of it, and the mainly Minoan artefacts are well lit and pleasingly arranged. The ceramics collection is incredible. Here is some Kamares ware, it’s about four thousand years old. Many of the artefacts had come from the fabled Palace of King Minos, and we took the 20 minute bus ride there the same day. 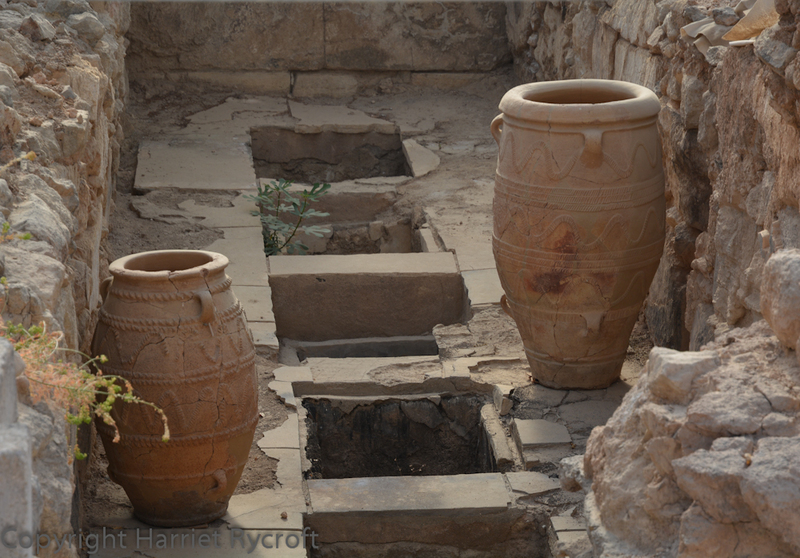 We timed our visit to Knossos perfectly, arriving as the tour groups began to leave and the sun began to sink, bathing the labyrinthine ruins in a warm, nostalgic glow. 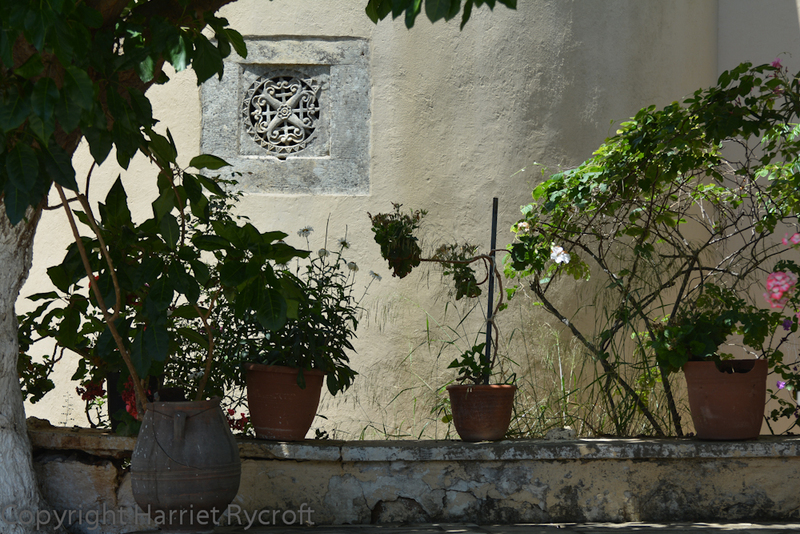 The first thing we saw was a family of hoopoes among the walls. Sadly I wasn’t ready with my camera, so I can’t show you a picture of them. But I can show you some big pithoi. 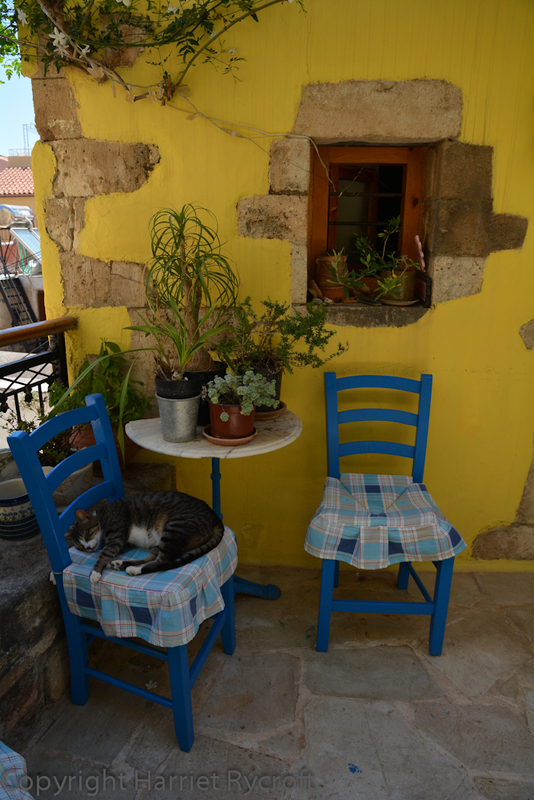 After Heraklion we moved from culture to hedonism, going to Plaka in north-western Crete for five days for some serious lying around by a pool. 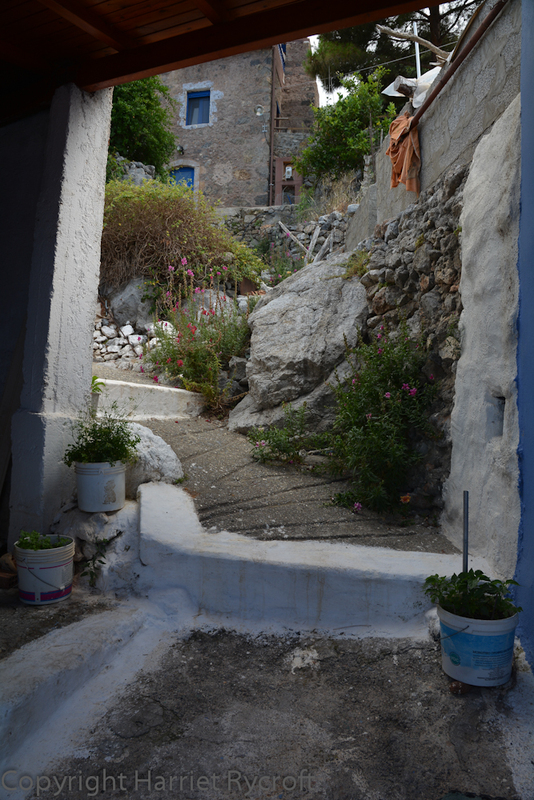 We wandered around a few little villages, sweating profusely and envying the Greek grannies parked in every shady courtyard. 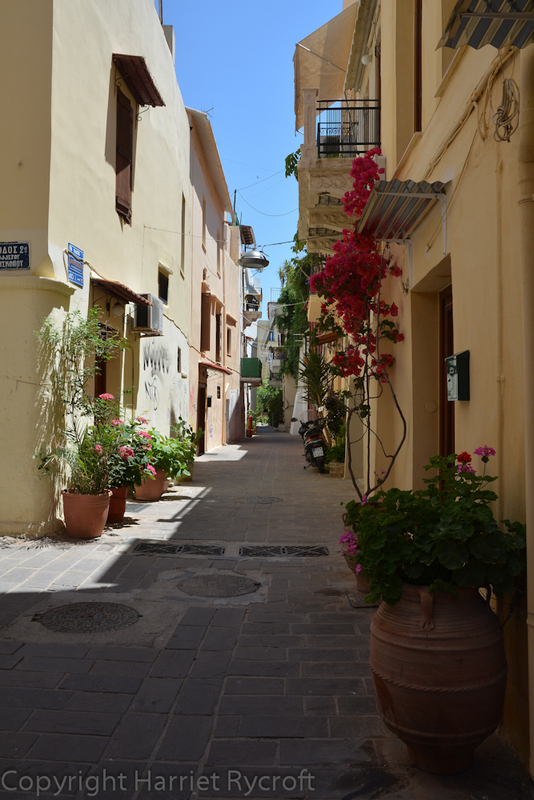 There was an excursion to the picturesque port of Chania (more sweating, souvenirs and a nice lunch) and at the start of the second week we drove down to Plakias on the south coast for the wedding. 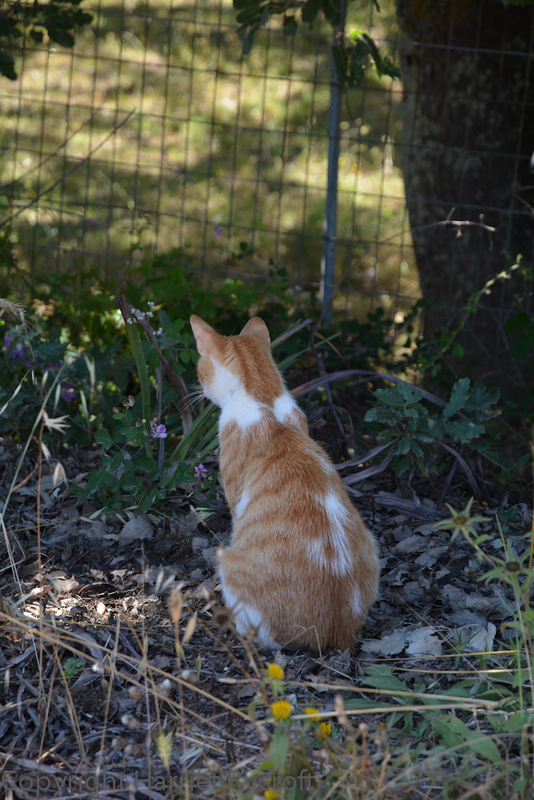 On these trips two major themes emerged for me: cats and containers. Together they began to make up for the bitter disappointment of missing the hoopoes. 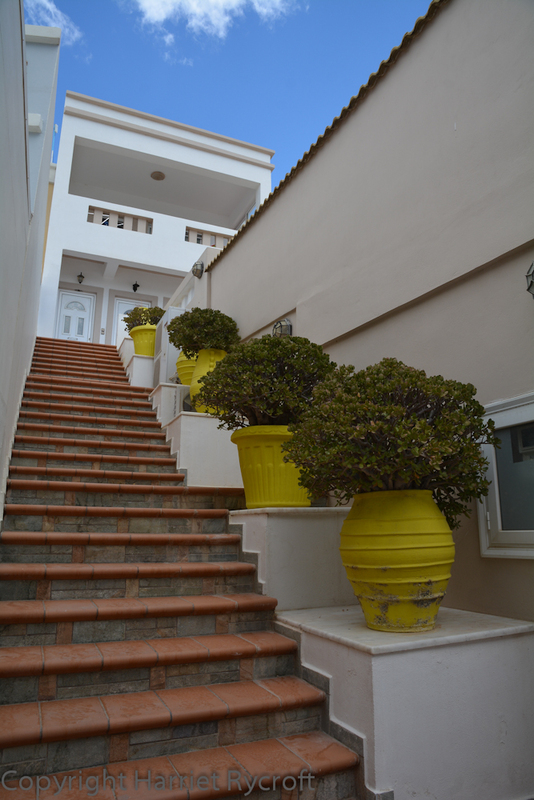 I love the fact that people everywhere seem to have the urge to clothe their space in greenery and will find ingenious ways to do so even if they only have a balcony, a staircase or a bit of pavement to play with. 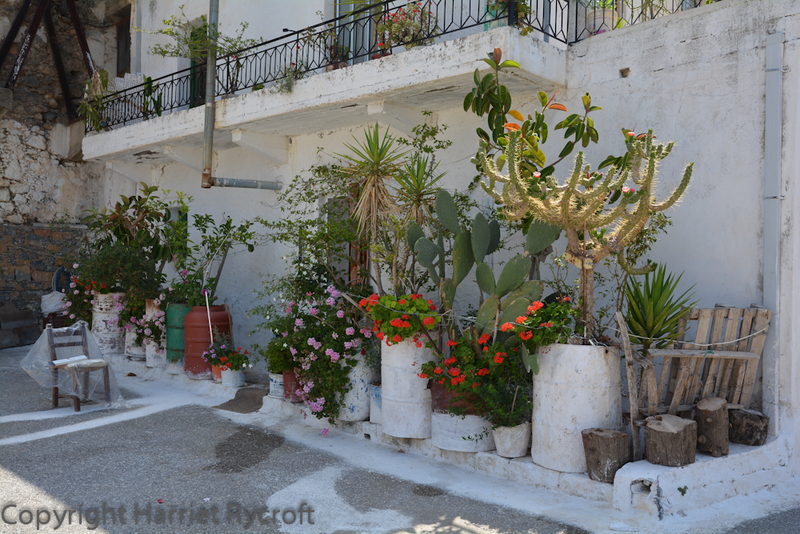 A jolly basket planting marks the entrance to the highest house in Myrthios, Crete. That’s Plakias down by the beach. 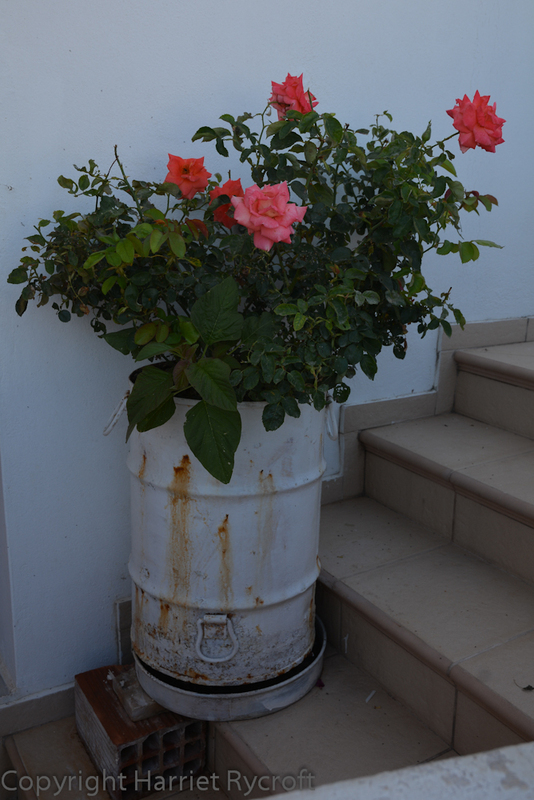 Ingenious use of oil drums and cans, plastic buckets and coffee tins pleased me the most. 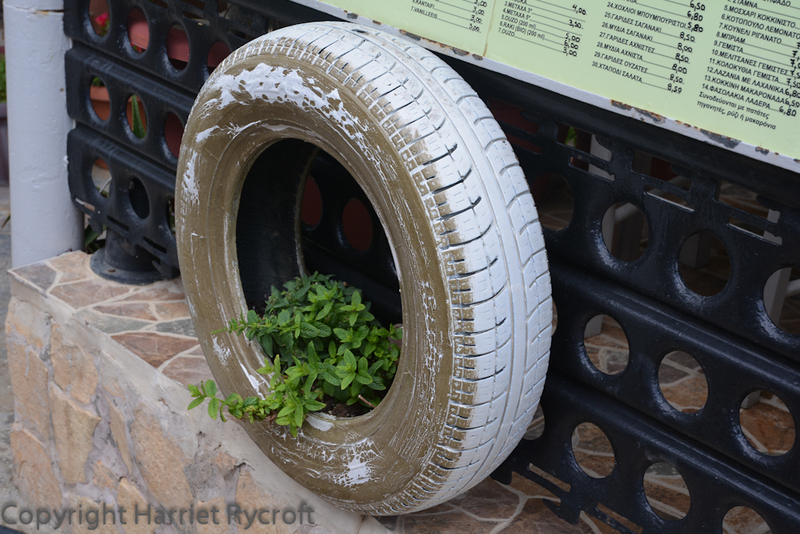 Sometimes they were painted for a smarter effect but I loved the immediacy of food containers used just as they are. They’d definitely need a few holes punched in the bottom in our climate. I didn’t dare inspect the underneaths of anyone’s displays though, just gawped and took photos. 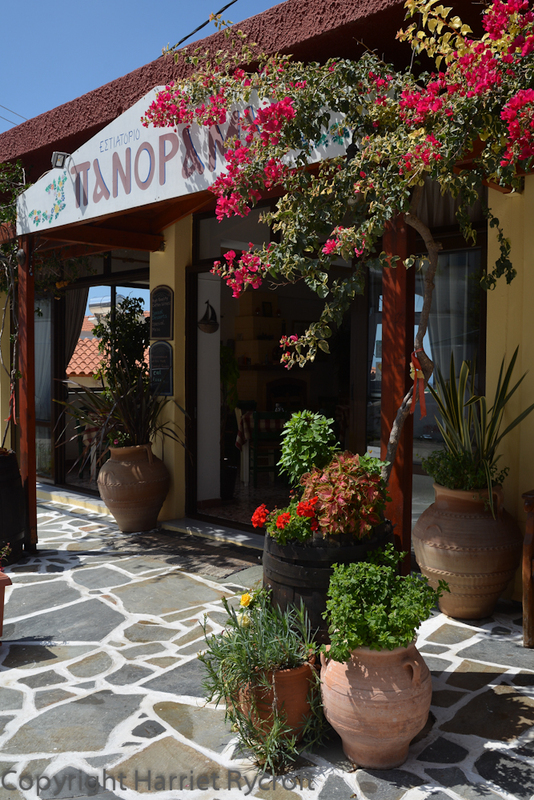 In every town and village there are delightful vignettes of artistry, ingenuity and love of nature. 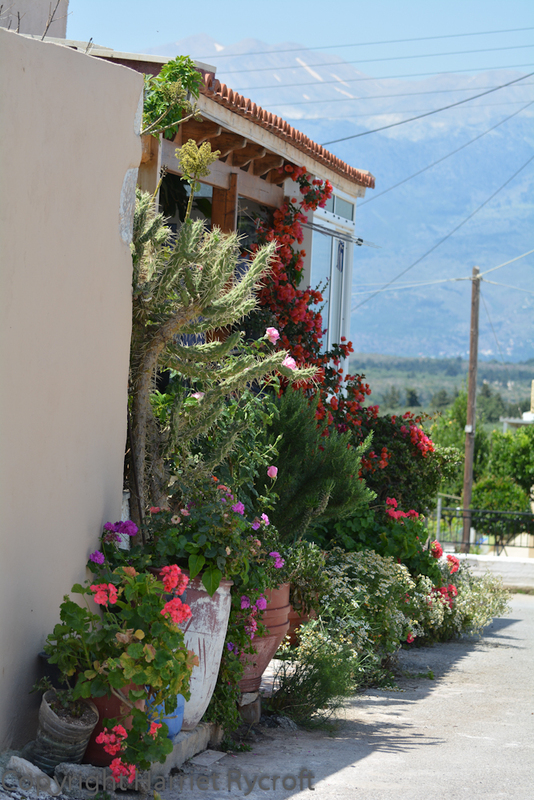 Like a cheerful front garden in the UK, these clusters of pots, barrels, pithoi and cans are a great way not only to personalise your territory but to share the joy of colour and gardening. It’s a generous thing to do and improves streets no end. 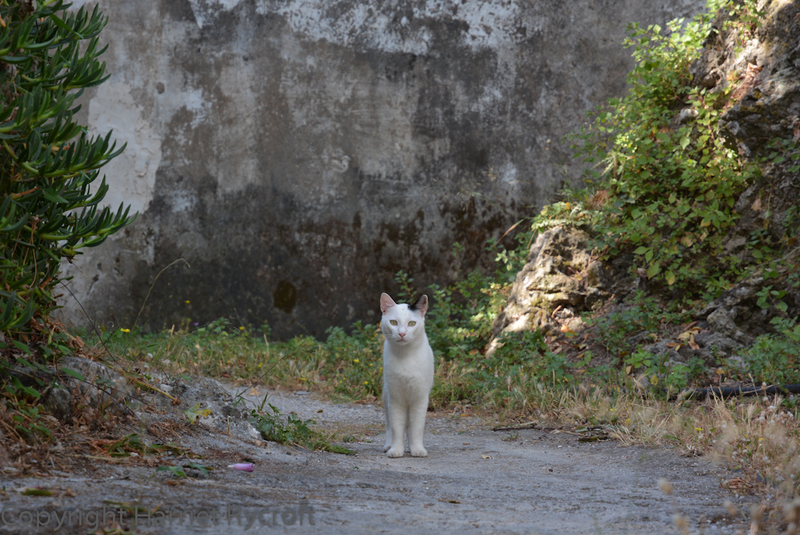 The cats were skinny and hard as nails for the most part. 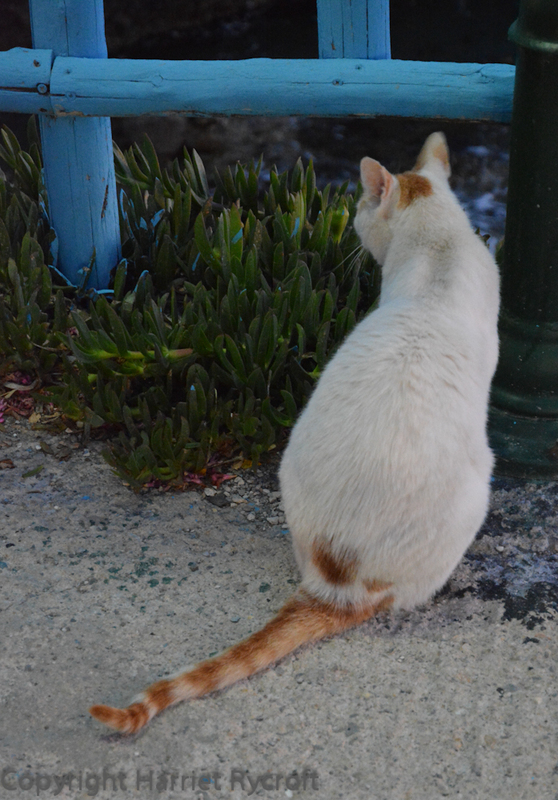 I think many were feral or semi-feral and they were often very nervous of humans but had obviously learned to supplement their diets by hanging around restaurants and market stalls, hoping for odd bits of fish. Not many pampered pets. 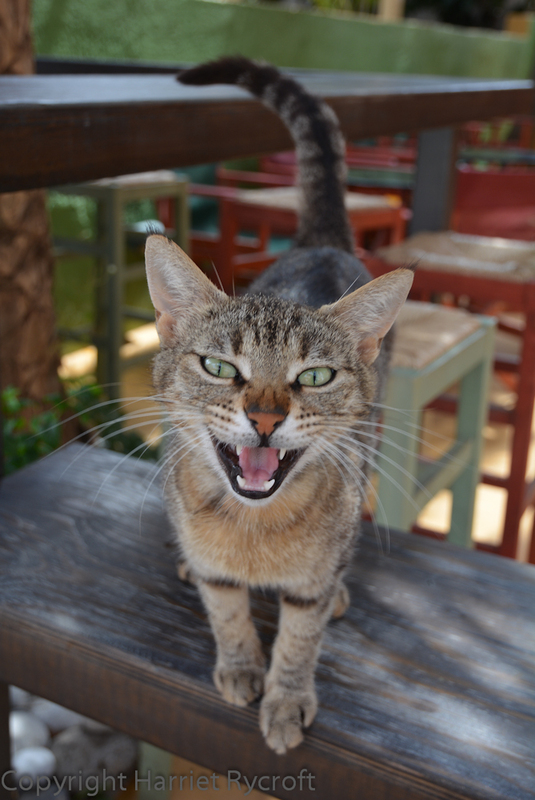 This one was eager for attention though! 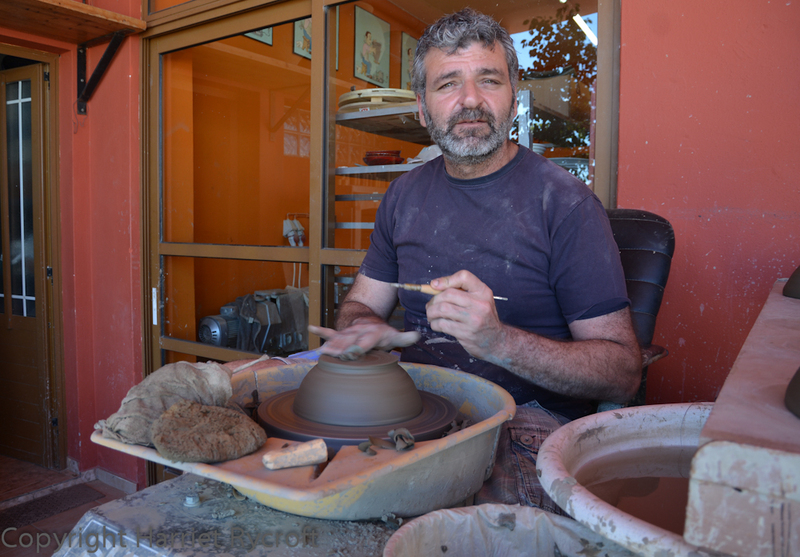 As we reluctantly drove off to the airport we dropped in on Stavros, a potter who has a workshop in Asomatos, one of the villages perched in the hills above Plakias. 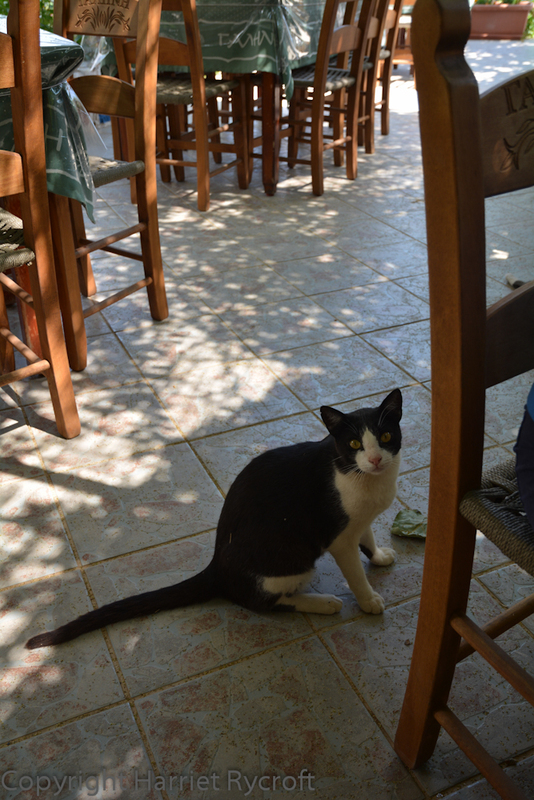 He’d been at the same wedding as us, but we hadn’t met him in the throng. 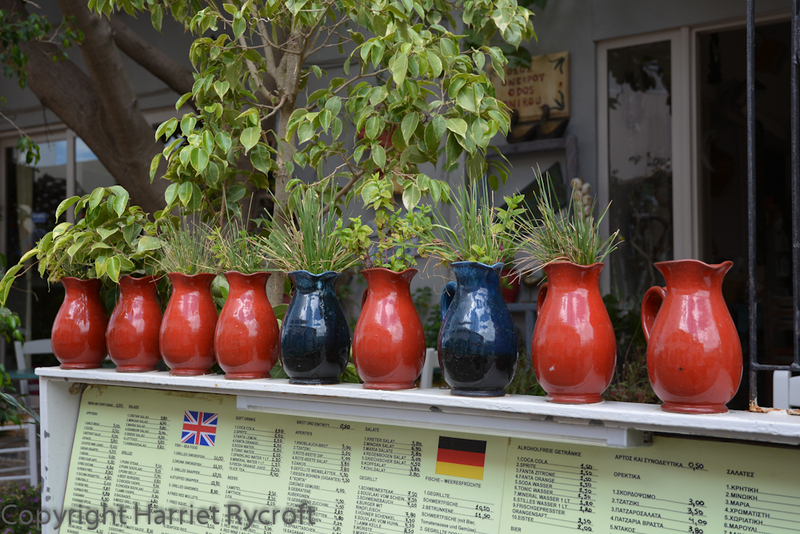 His work is mainly colourful domestic ware but he told me his grandfather used to make the big pithoi for which Crete is so well known. 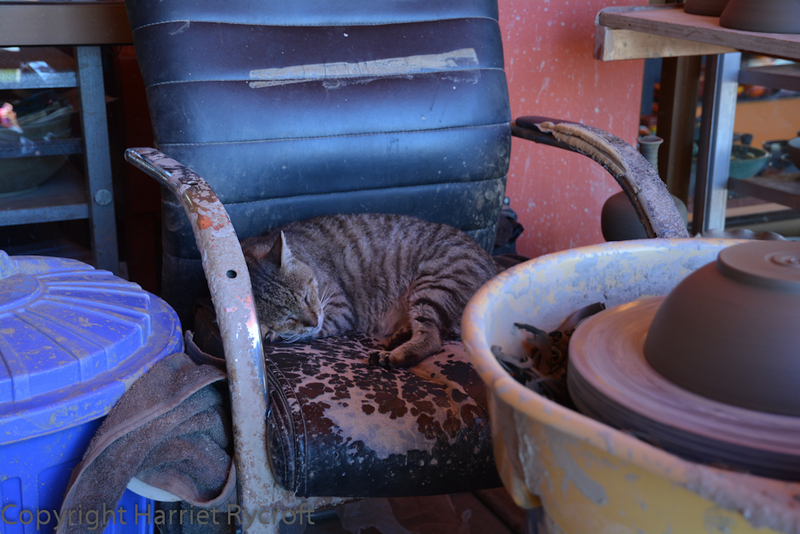 There was a big tabby cat sitting on his throwing seat which didn’t budge when he sat down and started turning bowls. Another cat sat peacefully washing in a reject bowl by the door. Seeing this comfortable relationship between a potter and his cats on our last day seemed to tie everything together beautifully. Stavros. 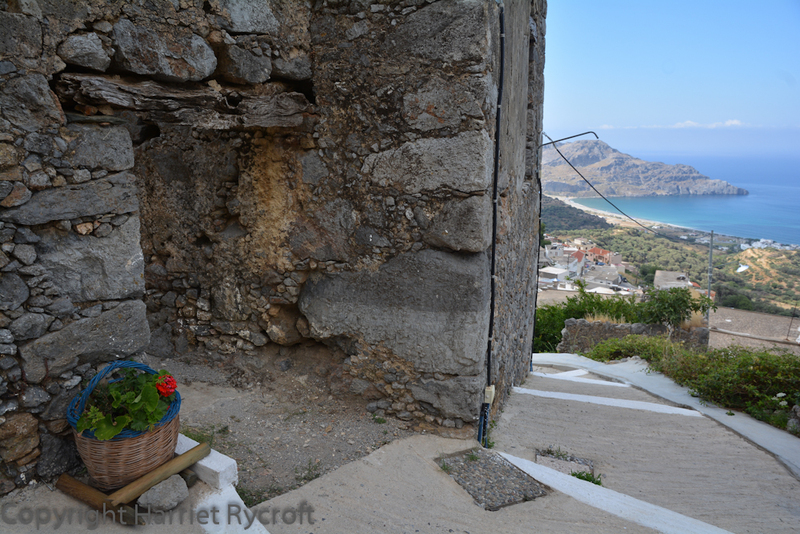 His wheel had an amazing view across the village and down to the sea. I’m amazed how they manage to make cruddy old containers look so good. You have a point that they don’t have to worry about drainage, unlike here. Gorgeous pics, very evocative. 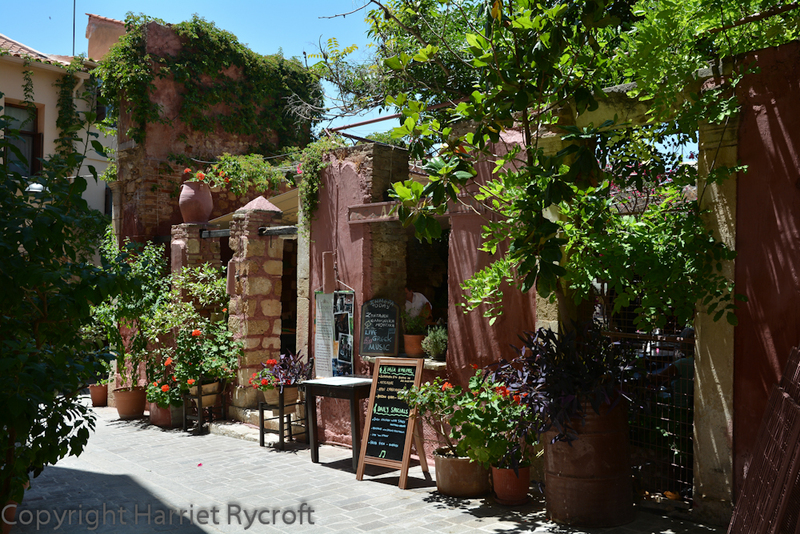 Crete is wonderful, Knossos is incredible! I enjoyed reading your cats and containers themed post. Thanks Julieanne, I think enthusiasm and sunshine make a big difference. 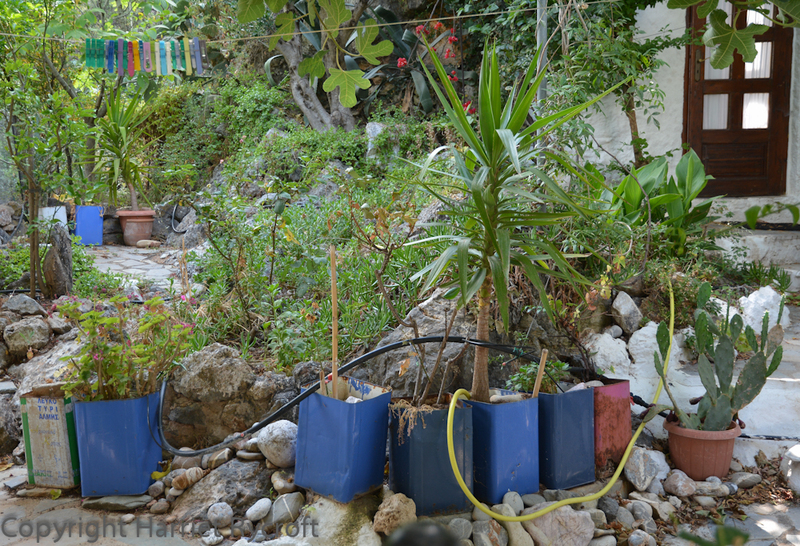 I did see plenty of half dead/dead plants in pots too, but the successes put them in the shade. 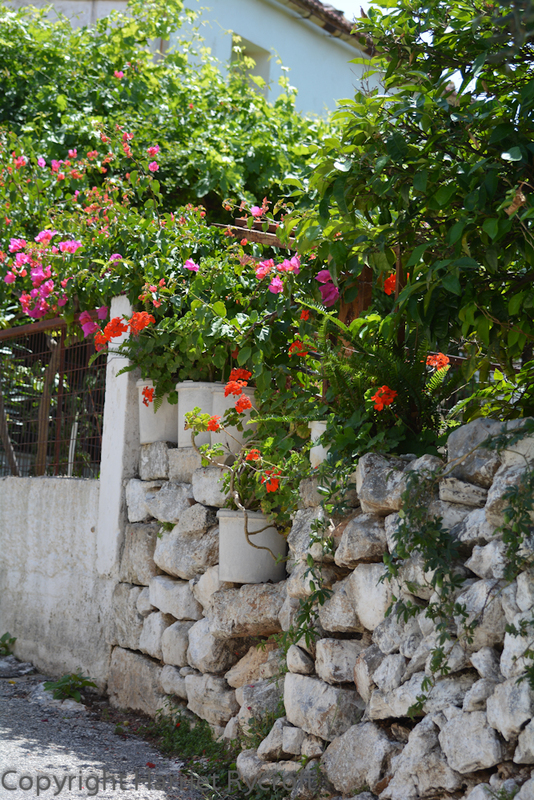 I’d love to go to Crete again, especially to see the wildflowers in spring. 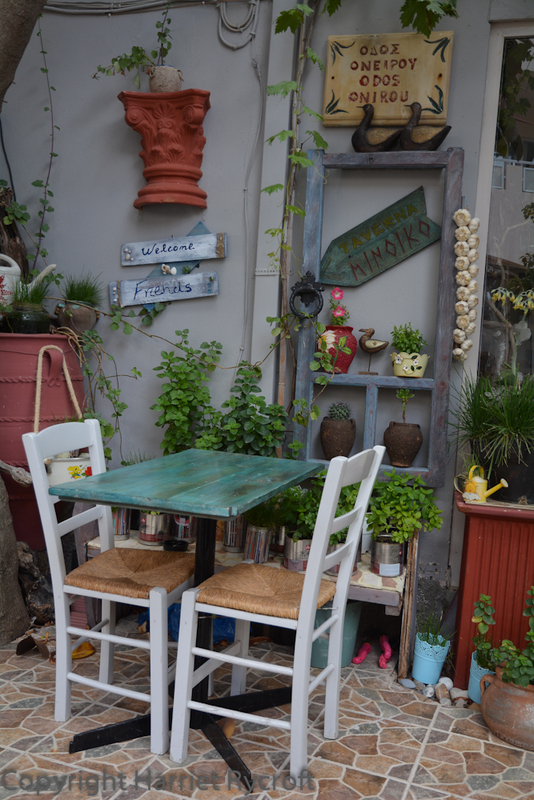 Great photos, and I agree about your philosophy with regards to the outside appearance of a place. It looks fabulous. The flowers look so much better in that glorious light. 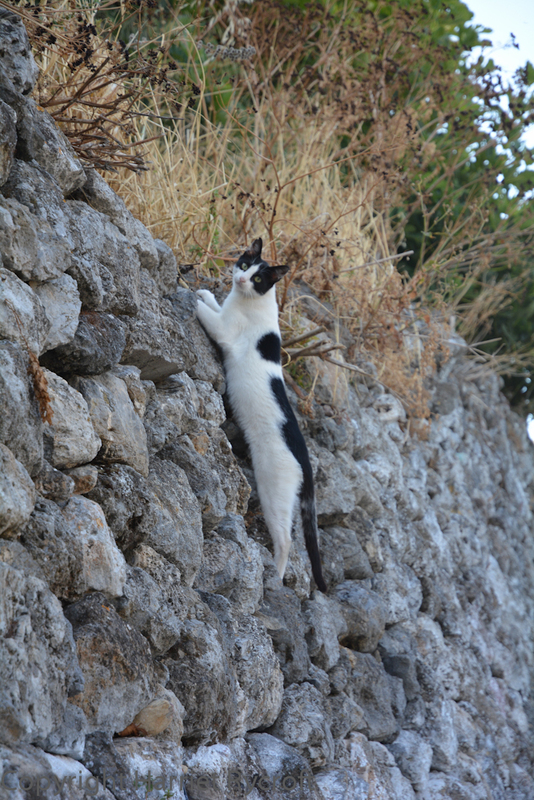 I feel for the Greek people in their current turmoil. 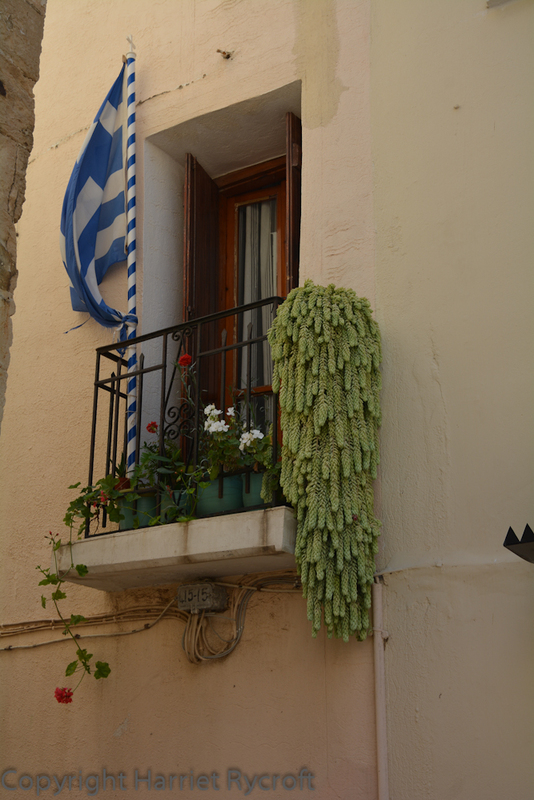 It’s a lovely country I’d happily revisit again and again. Yes, I’d love to go there again. We met lots of friendly people – and I hope that people continuing to visit will go some way to helping Greece get back on an even keel.